This sample price: priced within the past 7 days for arrival on Monday, July 15, 2019, departure from Los Angeles Intl, CA. Choose your own departure city and dates. Magnificent Middle East Experience! Fly into Dubai and discover such a glamorous city, famous for its modern architecture and stunning landmarks such as the Burj Khalifa, the world's tallest building. Explore Al Fahidi Historic District, packed of museums, craft shops and cultural exhibits. Combine this experience flying into Doha and get inspired by its spectacular mosques and museums including The Museum of Islamic Art and Al Wakra Museum. Walk around The Corniche, a waterfront promenade offering open fresh breeze and spectacular vistas of the city. A trip to Doha is no complete without a desert safari or a camel riding experience. This is a truly amazing escape. 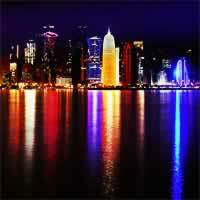 Doha, Qatar's capital city combines old world hospitality with cosmopolitan sophistication. Traditional wooden dhowboats lining the bay are evidence of the rich trading and pearl diving past. This is a city that honors its past and invites visitors to share its heritage. Visitors can stroll along the seven-kilometer long waterfront promenade around Doha Bay - the Corniche, enjoying spectacular cityviews of old and new Doha. It is easy to see why Doha has earned a reputation as the Gulf's capital of culture'. State-of-the-art museums such as the Museum of Islamic Art (MIA), open-air theatre performances at Katara Cultural Village, UNESCO World Heritage Sites such as the AlZubarah fort are all free of charge to visitors. Public art pieces are also installed in different parts of the country. The city offers authentic traditional experiences ranging from the lively bustle of an Arab market in Souq Waqif, camel racing, a dinner cruise aboard a traditional dhow or a moonlit desert barbeque under the stars. Doha boasts myriad cultural facilities, including the futuristic Education City and the National Museum. Museum of Islamic Art, Doha Corniche, Souq Waqif (An outdoor market famous for selling traditional garments, spices, handicrafts and souvenirs), the Pearl-Qatar (a man-made island), KataraCultural Village, Al Zubarah Fort and much more! Qatar is one of the safest places in the world. Both visitors and residents have the opportunity to experience the welcoming and friendly nature of Arab culture. Like anywhere else, visitors are asked to respect local traditionsand practices by dressing modestly. Lightweight summer clothing is suitable most of the year, but some warmer garments may be needed for the winter evenings. Bikinis and beachwear are acceptable by the hotel pool but not in public places in the city. Qatar has a desert climate with year-round sunshine, hot summers and mild winters. Monthly temperatures range from 62F in January to 97F in July, sometimes reaching highs of 104F during the summer months. 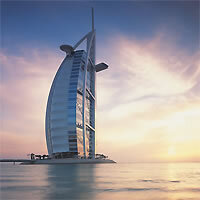 The official language is Arabic and English is widely spoken and understood. US Nationals may enter Qatar on the free visa waiver program. The waiver (delivered on arrival) will be validfor 30 days from the date of issuance and entitles its holder to spend up to 30 days in Qatar, during either a single trip or on multiple trips. Passports must be valid for 6 months from date of travel.